Hi there, my spur-thigh tortoise hatched in June '09 and has been a super problem free girl (her name is Phoebe) this summer she hasn't stopped eating and her weight and size were spot on for her age. However the last 5-6 weeks she has not woke up and will not eat. Naturally I've been waking her up and placing her under the lamp to keep warm and giving her warm baths to try and encourage drinking, but she is completely not interested. The last few days I've left her to see if she'll wake up or anything but no she's kept herself buried. So my question is what should i do? Keep waking her up and trying to feed/drink or let her just sleep as hopefully come spring in a few months she'll wake back up... I've been told not to hibernate her this year and start next year as she will be a bit bigger so is she sort of semi hibernating herself already? The best thing you can do for any tortoise is to stick to what it does naturally. Baby tortoises in the wild dont get told they cant hibernate this year. Aslong as you provide the correct temperature and dont let that temperature fluctuate it will be fine. Whatever you do dont put your tortoise in a "cool place" in the house as houses are too warm. 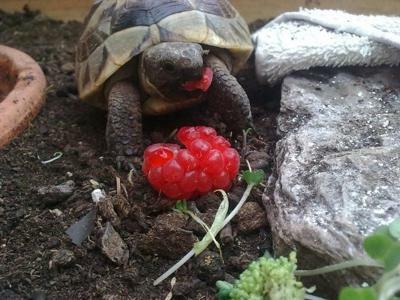 Your tortoise wont eat when it feels winter is on the way because it needs to be empty or the food will rot inside it during hiberantion causing death. First of all, thanks for sharing such a cute photo of you tortoise. This page is very long, and not everything applies to your situation, but you maybe find the section called "OVER-WINTERING OR NON-HIBERNATING" helpful.